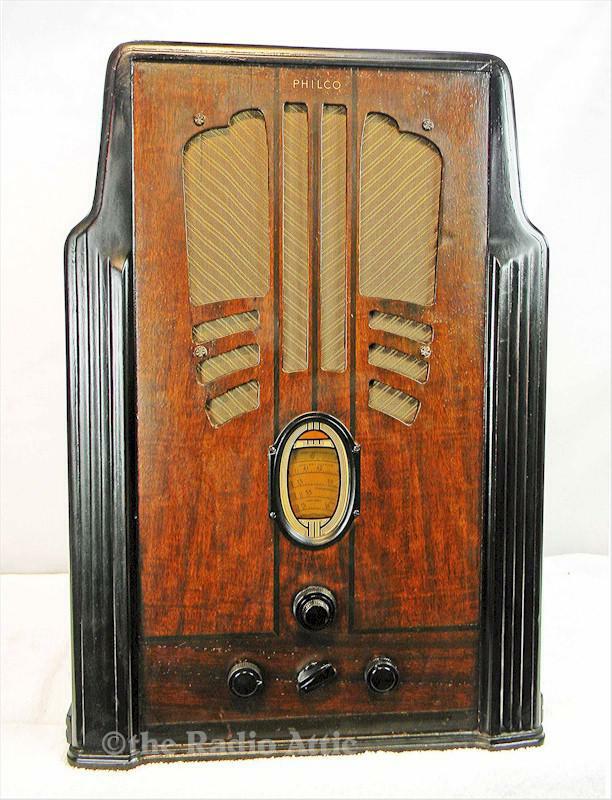 You are looking at perhaps the finest tube radio ever made. The flagship of the dominant factory of the era, this skyscraper-shaped monster has an eleven-tube super-het chassis designed to play on five bands (three are vacant today) and offers a huge 11-inch speaker. I have one of these in my own collection for the sheer sound quality and extraordinary performance. This is a nice cabinet with an original front and a measure of touch up on the trim areas. The radio was a bit difficult to photo as it is so large and with tremendous detail. The skyscraper shape was the rage of the period. Les has completed his professional repairs and the radio is remarkable! Added to the circuit is a mini-jack allowing your connection of any modern device. The huge speaker offers a hi-fi level of sound output and performance. Add a Bluetooth device for only $25 and stream audio within the same room. The sheer size of this radio will be a bit more expensive to ship. 23-1/2"H x 16-3/4"W x 13"D.